I flew back from Italy yesterday with MM and his parents. After a 9 hour flight and being 6 hours ahead in the time difference, I came into work to get myself organized to drive to Pittsburgh today for Christmas! Exhausting, I know…I’m hoping I can make up for the sleep deprevation in Pittsburgh. I usually do a lot of relaxing when I’m home. Needless to say, the holiday season has severly damaged my daily posting schedule. I promise to be much better in 2009. As soon as life begins to resemble its crazy self, I will be back and actively posting! After a week in Italy and a week in Pittsburgh, I know I will have plenty of stories and delicious meals to share with all of you! 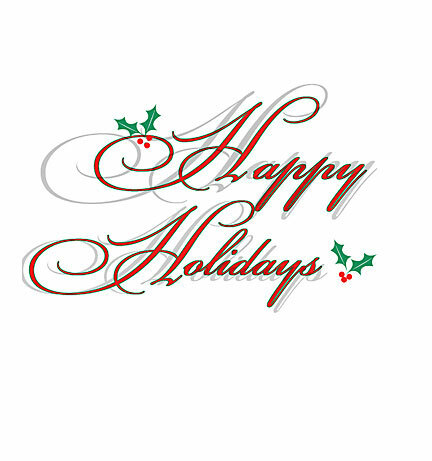 In the meantime, I wish everyone a very, very Happy Holiday Season! MM and I are in Italy for his sister’s wedding and the planning of our wedding in Tuscany! Fantastico! We stayed in the village where we will be married in May last night and it was the most exciting and amazing experience I have ever had! From the castle where we will have our reception to the little church where we will be married to the village of apartments where our guests will stay…it will be a dream wedding that no one I know has ever seen! 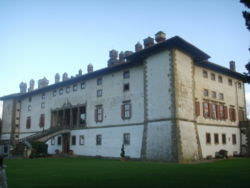 On Saturday, MM’s sister will be married in Bergamo – a city about 30 minutes north of Milan. She is being married in a very intimate wedding in a church that was built a few thousand years before Columbus even knew how to sail…let alone “sail the ocean blue.” I am very excited to be here to experience these things with my new family. Along with them, Italy is as amazing as it ever was. The food, the people, the little cars, the terraces, the coffee…the list goes on and on. I have fallen in love with not only an Italian man, but the entire Italian culture. You’ve probably noticed I like to PLAN events, parties, get-togethers, and anything that requires people coming together…since MM and I are leaving to Italy this Sunday, I felt the need to have one last holiday HURRAH with our closest friends. The prefect way to make it easy on everyone and not an expense to any one person is to plan a Holiday Happy Hour complete with Christmas Tinis! So, I needed to figure out the perfect venue to compliment our mental state of celebrating the holidays…nothing is better than Rolf’s at Christmas! Rolf’s is a Christmas institution in New York – much like the Rockefeller tree and ice skating in the park. This rustic, Bavarian dining room is transformed into a Christmas spectacular! Twinkling lights, Teutonic dolls, garland, and ornaments don the front bar. Stained glass windows and black & white portaits surround the jolly potrons as they feast on German comfort food. They even serve a seasonal roasted pig ceremoniously at the tables in back. It is usually a packed mess around this time of year, but I and found out they don’t have any private events booked tomorrow evening. So, we’re going to go and celebrate and let Rolf’s atmosphere be one of our guests! Prosecco – the better bubbly! So what exactly is this sparkly Italian vino? Prosecco is a variety of white grape grown in the Veneto region of Italy, and also gives its name to the sparkling wine made from the grape. The grape is grown in the Conegliano and Valdobbiadene wine-growing regions north of Treviso. 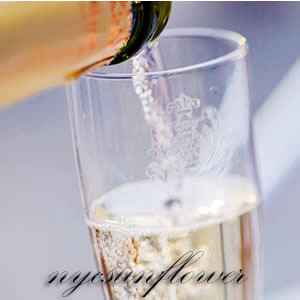 It ripens late with leads to its dry sparkling (spumante) and semi-sparkling (frizzante) wines. Prosecco is served chilled like most whites and sparkling wines. It is typically a toasting beverage, but it also appears in several mixed drinks. It was the original main ingredient in the Bellini cocktail and in the Spritz cocktail , and it can also replace champagne in other cocktails such as the Mimosa . Next Christmas, I’ll request Prosecco from our guests…but I’m certainly not complaining that they brought anything at all! And for you Champagne drinkers out there…Veuve Clicquot is apparently very good. This brings me to Gnocchi because I was always confused about its pronounciation until the moment I learned about the silent ‘g.’ This ‘gn’ is pronounced with your tongue pressing against the entire top of your mouth as opposed to the normal ‘n’ which is pronounced with the tip of your tongue on the back of your teeth. Confusing, but the difference is there. Gnocchi is the Italian name for a variety of thick, soft noddle or dumpling. They may be made from semolina, wheat flour, potato, bread crumbs, or other ingredients.It’s been a traditional Italian pasta type since Roman times. It was introduced by the Roman Legions during the enormous expansion of the empire into the countries of the European continent. In the past 2000 years countries have developed their own specific type of small dumplings, with the ancient Gnocchi as their common ancestor. The use of potato is a relatively recent innovation, occurring after the introduction of the potato to Europe in the 16th century, which is something interesting to know since most Americans associate gnocchi with potatoes. 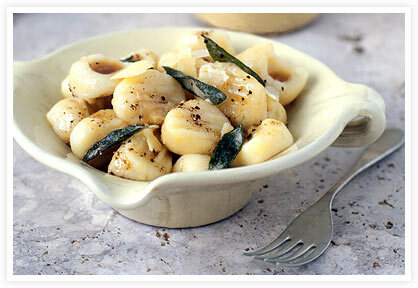 Gnocchi are eaten as entrees (primi piatti) in Italy or as alternatives to minestre (soups) or pasta. Gnocchi are widely available dried, frozen, or fresh in vacuum sealed packages in nearly all supermarkets in NYC. Classic accompaniments of gnocchi include tomato sauce, pesto, and melted butter with cheese. MM and I began a tradition 2 years ago by throwing an outstanding Christmas party in my apartment – the stories are still circling. Last year we threw another, and so now we are the yearly Christmas party throwers. This year, however, will be our first opportunity to have friends over to see all of the renovations we just did. So, we want to make it really nice. We have all of our decorations up, the finger foods are ready along with the host party gifts – all personally picked out and then wrapped by me (my back is still aching). We’re relying on our guests to bring the drinks, which helps with the cost – big time. My idea is to have everyone pick a number from a hat, which will coorespond to their gift. I bought a lot of the gifts at Ricky’s, which means they are pretty sarcastic and hilarious. This will get everyone laughing and ready for a good time. Our friends are fabulous people, so we don’t usually struggle to have a good time. I decorated with all white and gold. Plenty of candles and pine smells – that’s all you need to get everyone in the mood. 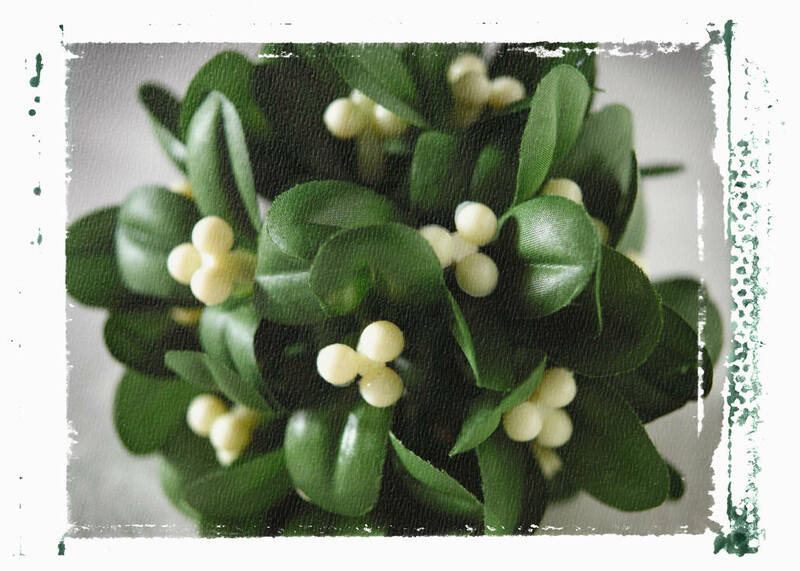 I need to pick up some mistletoe on my way home, though. That always adds to the fun! 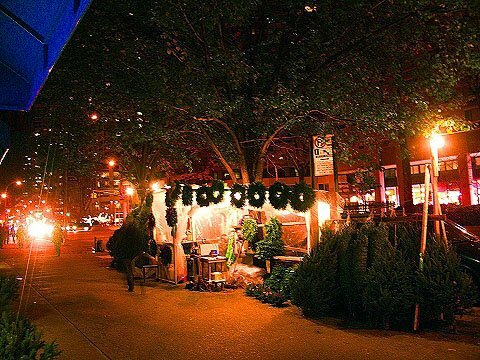 MM and I got our Christmas tree last night in honor of the Rockefeller tree lighting! I was so excited to visit our tree men on 2nd Avenue between 19th and 20th Streets. MM and I began our tradition in my neighborhood last year, so this was our chance to make it an official tradition. These men are super nice and very sweet. They help you choose your tree (they don’t rush you or get annoyed when you ask to see 20 different trees), they cut off the bad branches, and they wrap it all up to make it easy to carry home. The kind gentleman even cut an extra piece off of the trunk and gave it to me with the special hint of getting it slightly wet and placing it on the radiator to make the entire apartment smell like pine. With a jolly “Merry Christmas!” exchange, we were on our way! We got a nice 4 foot pine – simple and compact – perfect for a one-bedroom. MM carried it home on his shoulder – a trend that began two years ago when he cut down his first American Christmas tree with my family in Pittsburgh. We got it all set up in the corner on a silver pedestal to give it some more height without increasing its circumference. I put on the lights, the balls and a angel on top. Before we knew it, we were done and Christmas had come! We have less than two weeks with our lovely little pine since we’re going to Italy on the 14th, so I’m going to make sure I enjoy every minute of it. It’s a torture to get so excited by the presence of something that represents a season full of love, joy, family, parties, and fun – when it has to come down, it brings a slight depressing feeling. BUT, we won’t think about that right now! I’m off to see my tree!